In the old days, meaning before six months ago, I would walk around my house one windy day each autumn with a lit match in one hand and a caulk gun in the other. I’d try to triangulate the entry points of drafts, then vanquish them with the caulk gun. All this effort served to make my home more comfortable and probably saved me a load of money. Of course, I’d also wind up with singed fingertips, and burn marks on the rug. This year, I’m fighting drafts two-fisted. I sling the caulk gun in one hand, and my Black & Decker Thermal Leak Detector TLD100 in the other. It helps me find the draft, and I’m far less dangerous to my fingers and the carpeting. 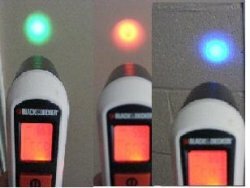 It’s really just an infrared thermometer but someone had the bright idea to add projecting colored LEDs that will change colors as you move the beam over hot and cold spots. You aim it at any surface and it reads the temperature and the light shines green. As you move the beam across your walls, the light will change colors – to red for hot-spots, to blue for cold-spots. 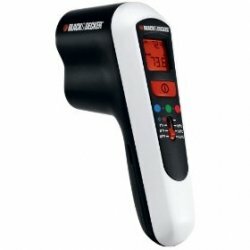 You can set the sensitivity of the device for changes of 1, 2 or 5 degrees Fahrenheit. It’s such a simple idea, and it works. With my new toy, I found a few leaks around some windows, and a portion of a wall that missed getting insulated 25 years ago. The best parts, in addition to the energy savings, it’s very reasonably priced at about $35. It’s also useful for testing the efficiency of your insulation. It’s also a great conversation starter at parties.